Telaviv1: My name was used for cyber fraud: An order for translation which was never paid. My name was used for cyber fraud: An order for translation which was never paid. I suppose there were warning signs. 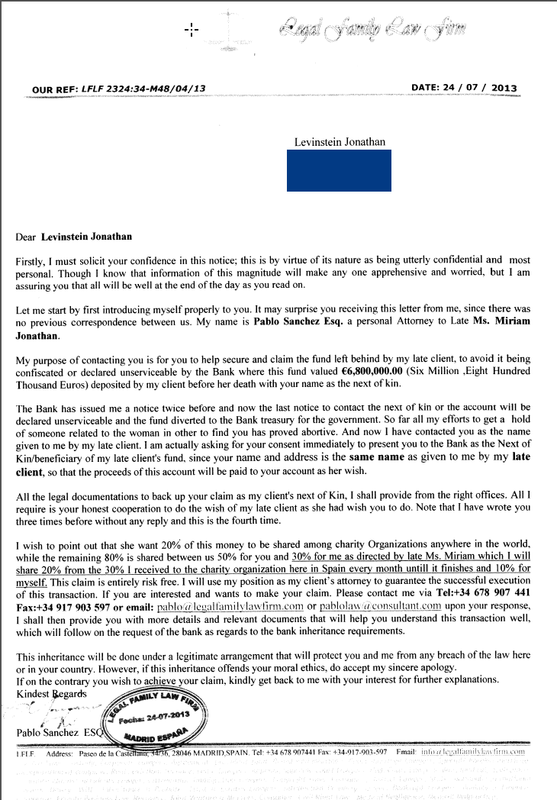 First I recieved a snail mail version of the Nigerian scam (in this case it was Portuguese) telling me I had inherited 650,000 Euros. Your Facebook account was recently logged into from a computer, mobile device or other location you've never used before. For your protection, we've temporarily locked your account until you can review this activity and make sure no one is using your account without your permission. - If this was not you, please log into Facebook from your computer and follow the instructions provided to help you control your account information. - If this was you, there's no need to worry. Simply log into Facebook again to get back into your account. The login proved to be from Ohio using a Mac. I don't use Macs and someone in Ohio had got hold of my password. This was worrying. In between I got a request to connect on LinkedIn from a German translator. I occasionally get these requests from people I don't know. If they look interesting and reliable I sometimes accept and this guy looked OK and I thought he might have some interesting connection, so I agreed. Then yesterday the German fellow suddenly sent me an angry mail saying I owed him 700 Euros. It emerged that somebody using my name (spelt Löwenstein with an "umlaut") had ordered a large translation job relating to search engine optimization (SEO) which is the process through which websites get Google to bring them more visitors. He thought it was me and that was why he "friended" me. They gave him an address which was not mine. I checked all the other Jonathan Lowensteins online (we're a relatively exclusive brand) but I could find no other in Israel. I exchanged some mails with the translator and he forwarded me the e-mail containing the translation order. I tried to trace the e-mail but failed. So I checked one of the documents he had translated and found it was for a website: http://www.jetztabnehmen.net/Abnehmen-mit-Schuessler-Salzen.php. If you click on the link in the website it takes you to http://www.meddirekt24.com/ which is a site selling some kind of fake medicine. I recently read an excellent article about fake medicine sites inWired (see this as well) so I guessed what was up. I guess they got their SEO material translated for free by posing as me, they even paid him a deposit to make it look genuine. So take care. I located the server housing the website, it was in the Czech republic but the server is probably rented and just holds a website. The business is elsewhere and these guys know their internet and won't be nearby. I suppose they are German speakers because the documents were in German and they spelt my name with an Umlaut. So the unlucky German translator didn't get paid in the end. It must have been a big piece of work if he was expecting 700 euros. Their mumblings still sounded cryptic or “ambigramic” but the puzzling was way easier than that of the flight attendant’s totally foreign language professional translation. Thanks to the holocaust movies my dad watches every now and then, I was somehow accustomed and prepared for the German’s morphology of my lingua franca.